Note: This post was updated with results shown below on August 8, 2018. Powdery mildew sure knows how to spoil a great garden party. July 4th, everything is going along just fine, then BAM - July 6th the white spots appear, like a pox on the beautiful foliage. 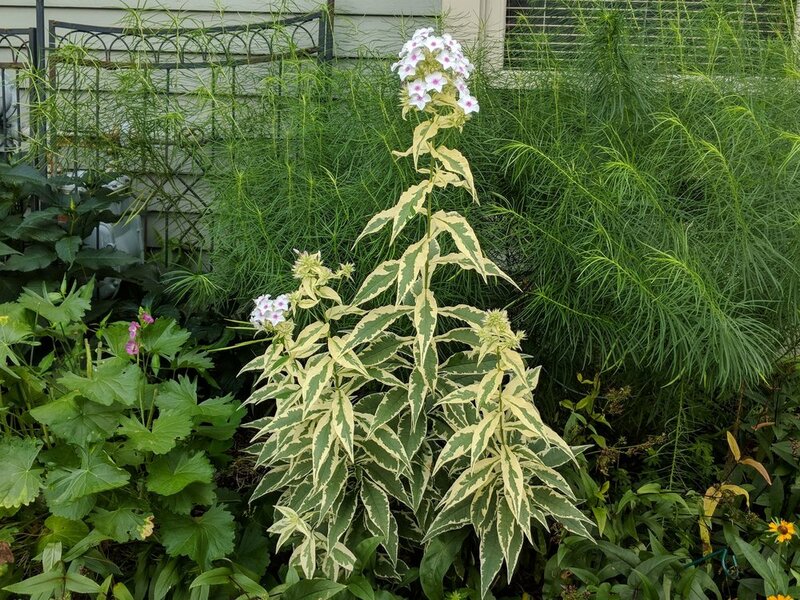 Tall phlox and monarda (bee balm) are particularly susceptible to this fungal infection, resulting in unsightly spotting and disfigurement of foliage. Penn State Extension has a helpful article here on the subject and explains the conditions that favor the development and spread of powdery mildew. While mildew is generally not fatal to the plant, it definitely detracts from the beauty of the blooms. Even the so-called "mildew resistant" varieties can be a huge source of angst for the OCD gardener, like myself. Over the years, I have tried a half dozen home made and commercial remedies with limited effectiveness. In moments of desperation, I have even ripped out old plant varieties and replaced them with newer, resistant varieties. Admittedly, I'm usually too late in recognizing the problem and in a state of denial when the little white dots start to appear on lower foliage. 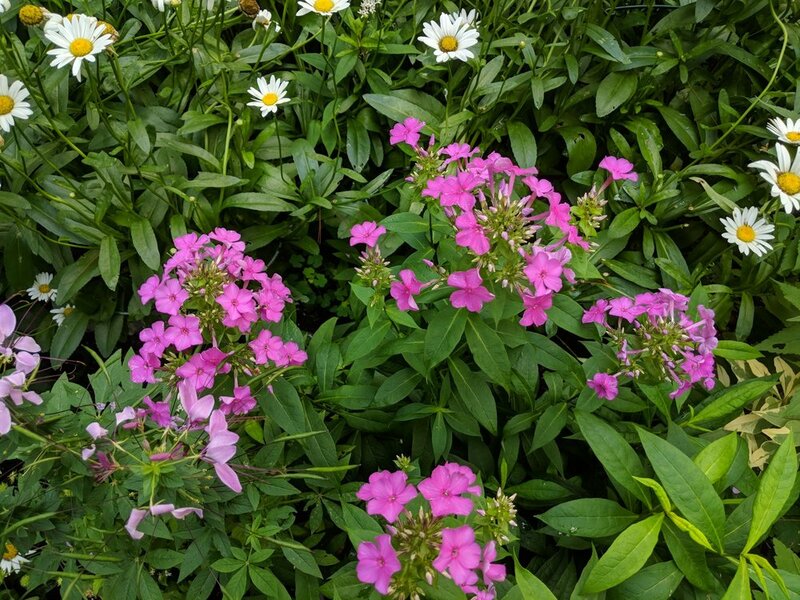 I'm also guilty of planting very densely, which can inhibit air circulation in the garden beds and increase the risk of disease. This year, I an committed to early prevention. I've learned from experience, that it's important NOT to wait until you see the white powdery spots on leaves to attempt treatment. By then it will be too late. At the advice of the great folks at Nashua Farmers' Exchange, I've formulated a plan of action to prevent powdery mildew and ensure healthy plants throughout the summer and fall. First step is an application of Agri-Fos (active ingredient phosphorus acid), alternating every 7-10 days with Serenade® (active ingredient bacillus subtilis). I've researched each of these products and they show no risk to pollinators* or wild birds, which is very important. I've learned that plants release most of their pollen in the morning, so timing of fungicide application either very early in the morning, or later in the afternoon helps to reduce any potential exposure for pollinators. 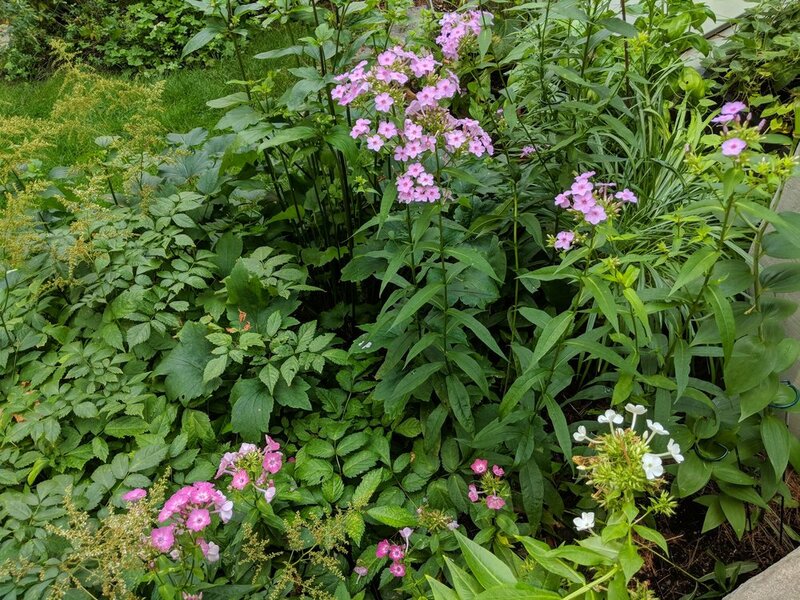 I will also do a better job of thinning out the phlox and the astilbe in the same bed to improve air circulation which should help minimize the risk of infection. Proper cultivation practices will also minimize the need for fungicide use. 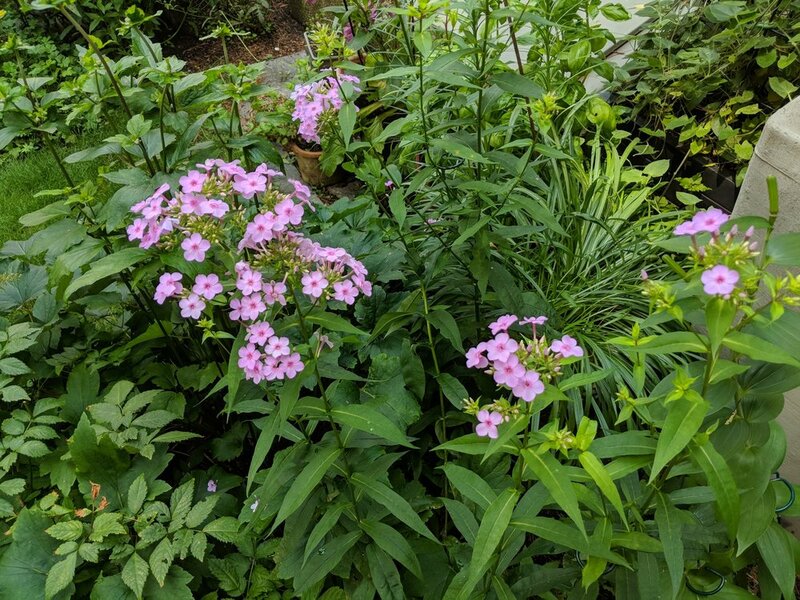 Phlox 'Shockwave'. This variegated variety is highly mildew-resistant! Today, a lovely Yellow Swallowtail butterfly floated in for a sip of nectar from the Phlox paniculata 'Speed Limit45', to prove that my treatments did not affect her enjoyment! These biologic controls have proven to be effective alternatives to synthetic agents and pose far less environmental risk. This first year "test" in The Big Little Garden achieved solid results with about 90% of treated plants showing no signs of mildew and 10% showing only minimal signs. 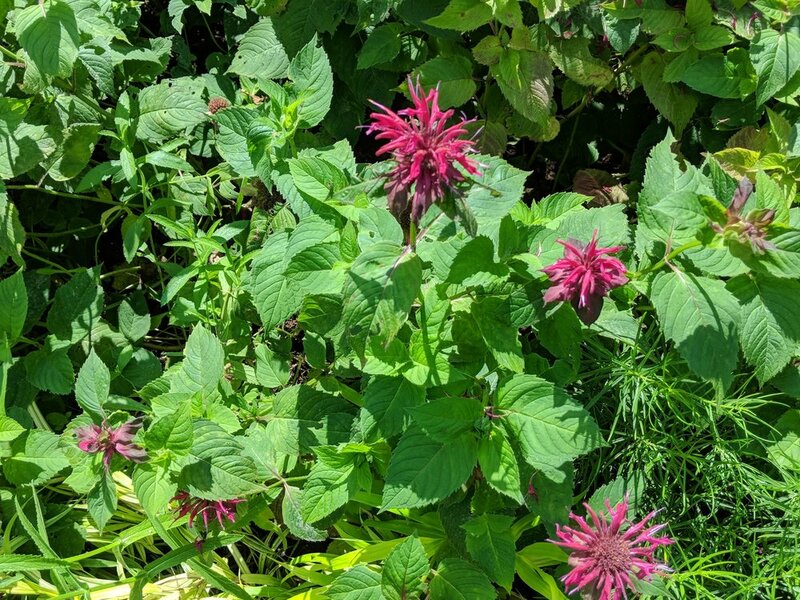 I will continue treatments through the summer and into fall, being careful not to spray blooms as bees and hummingbirds are quite active on these plants. 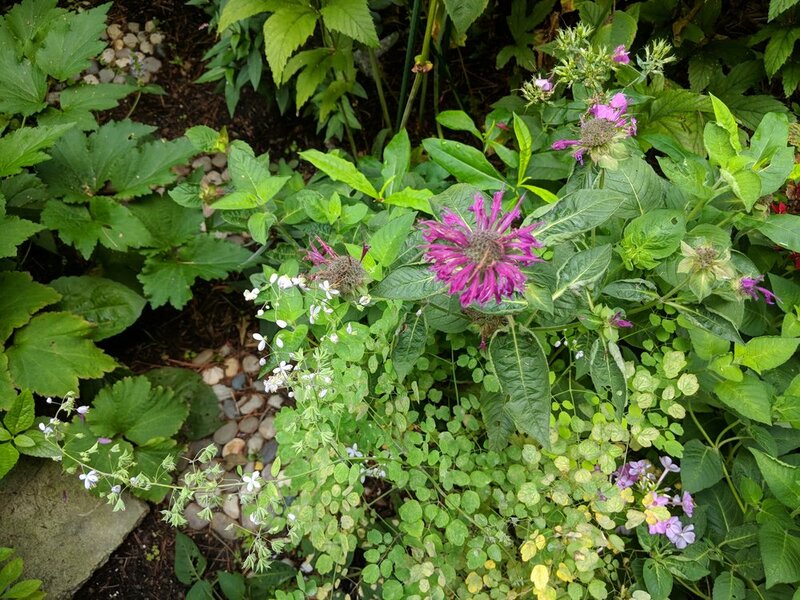 I have also added two more perennials to my treatment list: Knautia 'Macedonia' and Thalictrum 'Rochebrunianum'. Both of these are new additions to The Big Little Garden this year and have proven susceptible to powdery mildew.